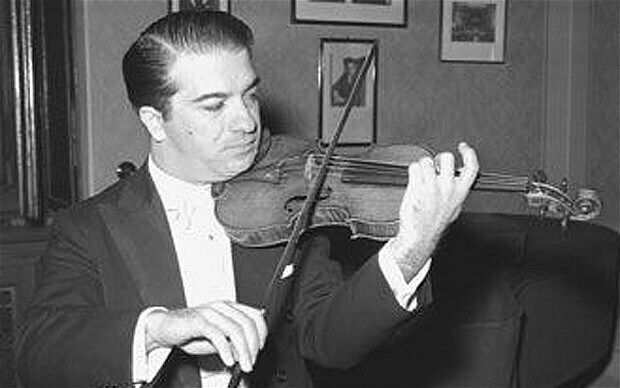 Ruggiero Ricci, who has died aged 94, was one of the great virtuoso violinists; he was described as the Paganini of the 20th century, and even in his eighties his fingers were still flying over music that violinists half his age had discreetly dropped. As a child he was named alongside the then Princess Elizabeth as one of “the world’s six most famous children”; as an adult he toured for more than 50 years, dazzling audiences with his skills; and in old age his masterclasses became pilgrimages for established artists and aspiring violinists alike. Ricci’s style was more reminiscent of the golden age of Fritz Kreisler or Jascha Heifetz than today’s homogenous maestro. By an early age he had mastered Niccolò Paganini’s ferocious Caprices, making the first recording of the works in their original form in 1947. It seemed that no matter how difficult the piece, Ricci could perform it with consummate ease, while his recordings of the Brahms and Beethoven concertos use almost every known cadenza. Like Isaac Stern and Yehudi Menuhin, with whom he shared a teacher, Ricci was at the forefront of a second generation of immigrants determined to make the “American dream” come true. However, possibly because of Menuhin’s association with Britain, his appearances here were less frequent than they might have been. Nevertheless, he drew headlines in London such as “Paganini pyrotechnics”. Ruggiero Ricci was born in San Francisco on July 24 1918, the third of seven children of an Italian labourer who encouraged all his children to play music for money; a brother, Giorgio, became a cellist, and a sister, Emma, was a violinist at the Metropolitan Opera in New York. At one stage his parents briefly Americanised his name to Roger Woodrow Rich. He was six when his father took him to Louis Persinger, himself a pupil of Ysaÿe, but Persinger passed the boy to Elizabeth Lackey, his assistant, who somehow gained legal guardianship of Ruggiero and Giorgio, which ended in a bizarre seven-month court battle in which their parents regained custody. At his debut in San Francisco, accompanied by Persinger, Ricci dazzled his audience with a virtuosic programme of music by Wieniawski and Vieuxtemps. Soon afterwards he drew a standing ovation with the Manhattan Symphony Orchestra in New York, leading one critic to write: “All that great violinists do, he did.” Within two years Ricci, commanding fees of $2,500, was supporting his family through the Depression. A crisis came in his teens. “People compared me with myself, saying I wasn’t playing as well as I did at 10,” he told The Washington Post in 1979. The Second World War proved to be his salvation. He served as an “entertainment specialist” with the US Army Air Force, where the frequent absence of a piano meant that he developed an affinity for the unaccompanied repertoire – from Bach to Bartók – that was to be a hallmark of many of his post-war appearances. In London in March 1954 he gave an entire concert of unaccompanied music at the Wigmore Hall; the following January he performed Tchaikovsky’s Violin Concerto with the London Symphony Orchestra. Over the years Ricci gave the American premieres of Paganini’s Fourth and Sixth Concertos, as well as introducing the world to concertos by Alberto Ginastera (conducted by Leonard Bernstein) and Gottfried von Einem (under Seiji Ozawa). But he never lost his apparently intuitive ability to dazzle with the great violin showpieces. He claimed to have given more than 5,000 concerts in 65 countries. Well into old age he was giving masterclasses at Dartington, in Devon, and in Salzburg. Even without a violin under his chin, he was entertaining, regaling interviewers with tales of the concert in India when a large spider was approaching his unsuspecting accompanist’s head and Ricci tackled it with his bow; when he was locked on stage in Brazil and could not leave the platform after taking his bow; and when his music fell to the ground but “fortunately it fell face up, so I followed the score on the floor”. In addition to hundreds of recordings, including another five of Paganini’s Caprices, Ricci kept up to date with the careers of many of the next generation of violinists, highlighting the performances of Vadim Repin, Hilary Hahn and Gil Shaham. He had two sons and three daughters from his first two marriages.